The objective of Instrumentation Tubing is to provide protection to wires, cables, capillary and fiber optic while retaining the flexibility in system design. Instrumentation tubing is made in two configurations, or constructions, commonly called Square Lock and Interlock. Interlock is further classified in 2 types – Floppy & Gooseneck on the basis of Flexibility. It is often abbreviated as SL and FI & GN respectively. Standard Grade for manufacture of Instrumentation tubing is Stainless Steel AISI Grade SS304. Other metals and various grades of Stainless Steel eg SS316, SS202 and SS410 are also available upon request. 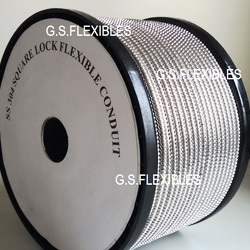 Square Lock Flexible Conduit is produced from a continuous metal strip, and is held in position by locking one leg of one profile over the leg of the adjacent profile. It has excellent flexibility, is light weight and is typically used in applications where limited to moderate strength is required.